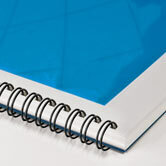 Advanced Document Systems and Supply, Inc. carries a large selection of wire binding supplies, including double loop wire binding supplies and wire comb binding supplies, which are all available through our on-line catalog. Double loop wire binding includes a double loop wire for a clean, professional bind that allows documents to lay flat and to be fully turned. Standard double loop wire is available in 2 different hole patterns: 21 loop (2:1) and 32 loop (3:1). The 2:1 wire binding elements are designed for machines that use the 2 holes per inch punch pattern. The elements are made from heavier gage wire to allow use with thicker documents. 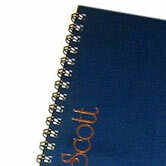 2:1 can also be used to bind books as small as 1/4". The 3:1 wire binding elements are designed for machines that use the 3 holes per inch punch pattern. The elements are made from thinner wire for a more refined appearance. They are for use with documents less than 1/2 inch thick. Please review our product offerings for both 2:1 and 3:1 double loop wire binding supplies for further information regarding sheet number, size and thicknesses. 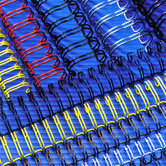 We also offer wire combs designed to produce wire–bound books using your plastic comb binding machine. Punch your pages with any plastic comb binding machine, insert the correct size 19 loop wire, and close with a wire closer. Use the built-in closer if your machine has one designed for wire, or use a separate wire closer. These wire combs have 19 loops to fit an 11" binding edge, although they may be cut to fit a shorter edge. For an exact fit, measure your finished document and use the sizes under document thickness in the table. Don't forget to include your covers when measuring. Colors in the online charts may differ due to variations in monitors. If color is critical to your application, please request a sample book. Browse our catalog of Wire Combs and other wire binding supplies. 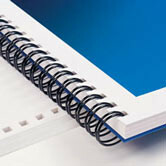 We also offer an extensive supply of coil binding supplies and Plastic Binding Combs. For all of your binding needs, ADSS carries a wide selection of binding machines, wire binding machines, and thermal binding machines.